In the two closest contests of the match, Blue Frog narrowly avoided defeat at the hands of Tim’s Texas Bar-B-Q, and The Local squeezed by Courtyard 4 neighbor Q Mex by a mere handful of votes. Top seeds reigned in most other matches, with seven of eight of the top two seeds in each division making it to the next round. The underdog The Garage, which made it farther than expected for a 12th-seeded venue, was knocked out by Great Leap Brewing. Eight of Beijing’s best burgers remain in competition from the original 64, and now the choices get really tough, given what remains is 80 percent of Beijing’s Top 10 burgers. 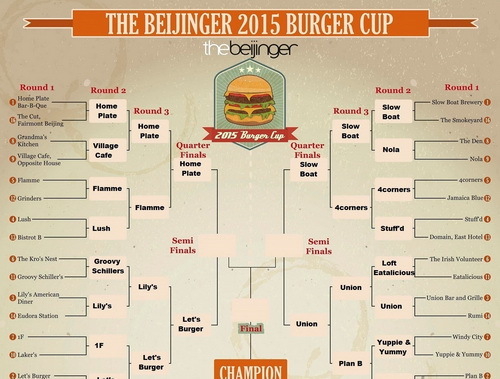 Keep your favorite burger place’s winning streak alive by casting your ballot in the Elite Eight here now: thebeijinger.com/2015burgercup – you have until Thursday (Sep 10) at noon to vote in this round. A summary of all of last round’s blow-by-blow action can be found here. This post first appeared on thebeijinger.com on September 6, 2015.